I went to the wall today ! ! Not the one in Washington , the one in Pensacola Florida. It is a beautiful park overlooking the bay. As I drove up I noticed the beauty of the landscaping and the bushes and shrubs all neat and trimmed. There were parking spaces and no one was there. My wife, Cheryl had asked earlier if I would like to go. I had said yes. We arrived and as I got out of the car an erie feeling came over me. It was spooky. It was not real. It was just in my mind. No way could this wall have any effect on this grown man. 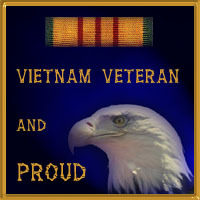 I have dealt with the Viet Nam war a long time age. I was over any feelings. The short walk up the ramp was no big deal. I can even walk up steps, most of the time. Why were my eyes watering. What were these feelings. I had no idea. As I approached the wall I stopped dead in my tracks. I told Cheryl I could not go any farther. Why ? ? My stomach was aching. I felt like throwing up. I was sick. Ten minuets earlier I was ok..... What happened? The tears came like a flood. I sat on one of the border walls and cried like a baby. I got up and started back down the walk to the wall. As I approached the second time, it happened again this time only worse than before. No way I just can not go to the wall. As I drove away I tried to tell myself it was ok. But it is not ok. It is wrong. It is shameful. It is a miscarriage of justice. It was murder. It is today still murder. I don't mean the war. I mean what happened to end the war. Do you remember the day the President of the United States ( Nixon) was on television and announced the end of the Conflict in Viet Nam. I remember, I ran to the bathroom and threw up. I won't go into that, suffice to say I was sick. As I remembered that day, I know why I could not go to The Wall. I now makes perfect sense. I want to go back and visit the fallen of the war. To give them a big thank you. But how can I, I still feel like the war was for nothing. Am I wrong ? ? ? What good came out of Viet Nam? ? ? What glory, what honor? ? Someone please tell me. I want to go. I want to visit The Wall. I want to thank the Men and Women who's names are there. But what can I say. Thank you for dying for nothing. There was a black flag below the US Flag on the pole at the park. It was the MIA/POW flag. What do I tell those men ? ? ? Thanks for being missing or a prisoner for nothing. What has happened to the honor of being an American Fighting Man or Woman? Where is the honor? What has happened to all the promises made to our men and women of the armed services? ? ? ? Who stands guard today? Who will stand guard tomorrow? Will the promises made to them be so many words, lost to the ears and hearts of our country? Why? I am ashamed to be an American, yet I would and could not turn my back on my country. I gave Uncle Sam 10 years of my life. I lost a leg doing it. Where is the healthcare I was suppose to get, It is in the same place with people whose names are on the wall. Lost to the ears and hearts of the People of the United States of America. Harsh words you say?? Ok then, where are our MIA/POW's???? Someone Please answer this for me, I need to go to The Wall. I can't in good conscience until everyone of the MIA/POW's are accounted for and then and only then can closure to this be accomplished.